Orders over $200 include shipping for US customers in the lower 48, 10% off for Canadian, HI and AK customers. Discounts will populate in the shopping cart once you "Add to Cart". 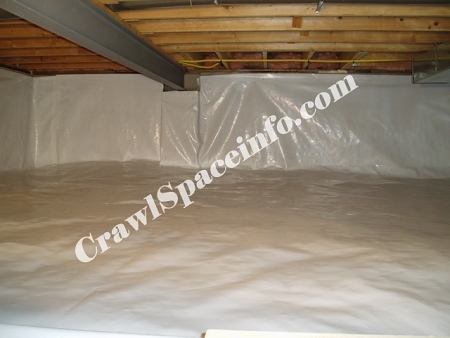 The 12 mil SilverBack™ crawl space vapor barrier is the best product to encapsulate a crawl space. Used by professionals to achieve results that back up their reputation. This product is made in the USA and from premium grade ingredients. We do not cut corners on our products. 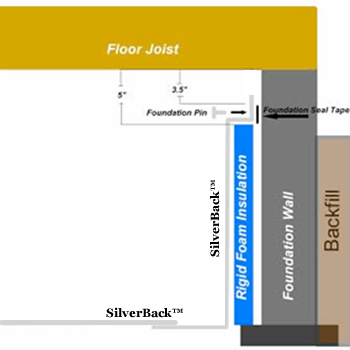 The SilverBack™ crawl space vapor barrier naturally resists mold and mildew. The face is pure white with a slight glossy finish. You will notice the diamond pattern string reinforcement throughout the product. The pure white finish gives this crawl space vapor barrier a clean and finished look once installed. In the center of the vapor barrier is a polyester cord that is secured into place with a molten layer of virgin polyethylene. This reinforcement will stop tears and contain any puncture damage to the area of initial damage. This reinforcement cord is very similar to the ones used in tires to keep the rubber from coming apart from the centrifugal force of rotation. The bond of the molten layer of polyethylene is superior to simply trying to remelt the front and back layers together. By introducing the molten layer it brings all the surfaces to the same temperature allowing a bond that is not just "remelted" but rather liquified together. This bond insures the SilverBack™ will never delaminate or allow air bubbles into the center. The back of this vapor barrier is silver in color and made from the same virgin polyethylene as the front layer. The color additives are for appearance only and do add a bit of cost to the product manufacturing. However, the color does not weaken the barrier in any way. The 12 Mil SilverBack™ is the best all around choice for most crawl spaces. It will handle light to medium storage requirements as well as traffic for regular home maintenance. If the SilverBack™ is going to be installed over sharp stone consider installing our Felt 550™ first to protect your SilverBack™ investment. This is the most popular SilverBack™ vapor barrier for crawl spaces due to its lower cost and high performance. Made 100% from premium grade virgin polyethylene resin. This Commercial Grade 12 Mil vapor barrier is true thickness, so our 12 Mil measures 12 Mil at the barrier not the string reinforcement. You get the absolute best quality and performance as well as the technical support you need to install our products and answer your questions. This 12 Mil SilverBack™ vapor barrier weighs 65 pounds (of plastic) per 1000 square feet. Compare that to the competitions 12 Mil @ 38 pounds per 1000 square foot. That is a 27 pound less per 1000 sq ft roll in material you are paying for. Due to the expanding and rising UPS handling and shipping fees we are forced to add $9.28 at checkout for each roll. This barrier is rated for light to medium storage. *IMPORTANT- Others claim their 12 mil vapor barrier is "heavy Duty" and rated for "Heavy Storage". Please be aware that using any 12 mil vapor barrier in a heavy storage environment will dramatically lessen its service life as a vapor barrier. A 12 mil is suitable for heavy storage if you are using the plastic strictly to keep your things from sitting in the dirt and not for moisture protection. We have used your 20 Mil in the past and it's incredible. But, this time we choose to use the 12 Mil instead and felt it was perfect for the crawl space. After receiving an expensive estimate for encapsulating my crawlspace, I decided to do it myself. This Silverback material was easy to work with in my opinion. I did most of the installation myself. I used a sharp pair of scissors to cut it. I used a drywall T and a sharpie to mark a straight line right on the back of the material. Despite being in a crawlspace, the experience was good! The materials were quality and the How To advice from the website was very helpful. I really appreciate crawlspacerepair's belief in the DIYer. I have an unfinished basement that I regularly use, but it was unfortunately open to the crawlspace... now it's encapsulated, the humidity is down, no more smell, and a much brighter, cleaner looking basement/crawlspace (also a solution to my high radon levels). One piece of advice that I heard somewhere but didn't take seriously- be smart about how you plan to unfold or unroll the barrier- I quickly found myself extremely stuck and frustrated in a ball of barrier. The first piece took me 30min to spread out in my 18inches of crawlspace. The second piece took me 5 minutes and a lot less sweat. My project has been done for months now, but I wanted to wait to see the results. It is all you said it would be! As well as a clean crawl space, it has kept my floors much warmer in freezing temps, and odors are down from where they were. The house is warmer than it has been in the last 13 years! Thank you for a wonderful product and great videos. I would recommend your products to everyone! I applied the barrier in my craw space and saw immediately benefits from it. The temperature in our living room went up by two degrees. Anyone one that comes to my house, I show them what I placed in the craw space. I purchased the 12 Mil SilverBackÃ¢â€žÂ¢ to encapsulate the crawl space under our cabin. The products were all as described and of excellent quality. The space after installation looks great and there was immediate improvement by eliminating orders and moisture problems contributing to a musty smell. I highly recommend the products and give excellent marks to CrawlSpace Repair for the service they provide. So far I could not be more pleased with the white/silver liner I ordered to be installed in the crawl space of our home. I had obtained an estimate from a local company that specializes in crawl space solutions. The installed price was over $6,000. After some on line research I found your site and product information. The liner I purchased is very comparable with what the contractor uses. I could not afford a solution totally comparable to the contractor's solution which did have other components I chose to eliminate, but I believe this was a great compromise. Compromising saved me over $4,000! The 12 mil. poly is phenomenal! 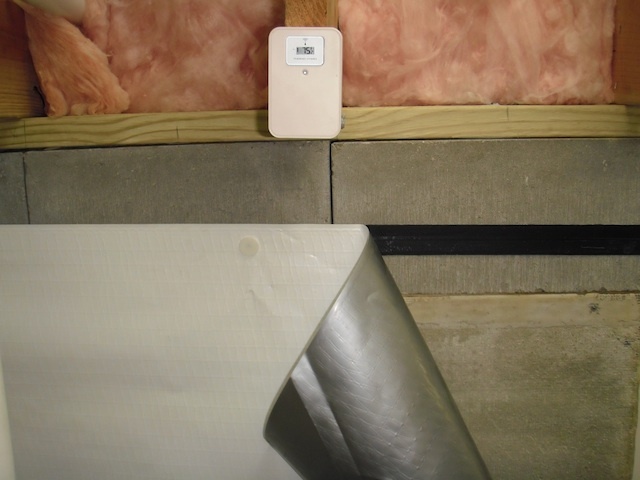 It is better then basement systems product, and cheaper! What a quality product and what a difference it made putting this in the crawl space. The 12 mil. coupled with the anchors to hold the barrier to the stone was perfect. Before, I was smelling a fungus smell and I don't smell it anymore. Install was easy because I had my floor removed doing repairs. I'm not sure how it would be to install this in a tight crawl space, but it's worth it! Thanks Crawl Space Repair, I'll be referring my friends to buy this product. We had a wet, stinky crawlspace that is 18 high. The hardest part was cleaning out the wet insulation that had fallen down. Installation of the vapor barrier was actually the easy part. Don't hesitate to give the guys a call. The first space we did was 23'x7'. They suggested an approach for laying out the plastic that worked really well. Working with smaller pieces is easier than trying to do it with one big piece (unless you know how to hover with anti-gravity). We saved over $6,000 by doing this project ourselves. Well worth it. Don't forget your tyvek suit and respirator though. Insulation dust is very nasty. This product along with mold control converted my dirt filled dark crawl space to a beautiful white clean mold free atmosphere. I told the installer when he completed the job, I would never have considered crawling underneath my house but the 12 mil vapor barrier made it inviting. Thanks so much! My annual termite inspector thanks you too! My salesperson's name was Bob and he was fantastic. I have completed my project and could not be happier with your product. The barrier was great, the tape works great, and the pins were easy to install. All I had to do was watch the instructional videos and I had no issues. Except for a sore back and knees! I have to tell you that the purchases I made were an excellent choice and made this job much easier to deal with. The product line is high quality, and speaks to the fact that your company is well experienced and knows what this type of work requires for success. I recommend you to anyone contemplating doing an encapsulation. It is rare these days to get what you pay for, and that's exactly what I received. The problems we had here with moisture and odor are now gone! Thanks for everything. Went through 40 days of rain in this area last summer, leading to a musty smell in the house. I investigated the crawl and was shocked at how awful it was. I opened it up and put in industrial fans to ventilate and, yep, the problem got worse. First step was to fix the gutters and the grade against the foundation. Also discovered I needed a new roof and HVAC but I digress. Once the water entry sources were handled, I began the task of closing the crawl and replacing the existing 4 mil black plastic installed loosely over 10 years ago. I got some bids for this and was stunned. The crawl space is large - approx 3000 sf - but I figured I could take my time and do this myself and save at least 10K. This is not task to be taken lightly. The workspace is damp, dark, and cramped and nasty. Those who are afraid of rodents, snakes, spiders, etc should have someone else handle it. Found a way to wrap piers and walls from another vendor without drilling and anchoring and it is holding up very nicely. Actually got a sample of 12 mil from another vendor and it was vastly inferior to the 12 mil Silverback from Crawlspace repair. Ordered 12 mil for less used portions and 20 mil for the areas to and from the entry to HVAC. This product is thick, heavy and easy to work with. The laying of the vapor barrier was actually the easiest portion of this months long project. The product is virtually impossible to tear, but even the 20 mil can be punctured by sharp rocks underneath. As there is a gravelled french drain in my crawl, I also ordered some of the felt rolls to place beneath the vapor barrier. The tape I ordered was fairly easy to work with but does tend to split and get more difficult to use as you get deeper into the roll. The before/after photos are amazing, but the real difference is in the air quality in the house. Humidity levels in the crawl dropped from the 80s and 90s to less than 60 without dehumidification. Addition of dehumidifier has dropped that number to below 50 with a stable temp of 70. This produces a dewpoint in the crawl well below the temp of the coolest surfaces (HVAC ductwork) therefore condensation is gone. I will follow up on any additional findings. I did my research and the products on this site are outstanding and worth the extra cost. I don't plan on redoing this immense project anytime soon, so I wanted to do it right. Impressive stuff. Very heavy duty. Cut cleanly, went in very well. Not a single tear or puncture in the entire project - which was a tough one. Highly recommended. Even tho it wasn't the easiest installation because of the issues with this old house, it ended up great. Product is durable and simple to install overall. Just installed it, so we don't have any history with it. If if works as well as the installation went, we will be very happy. The service was phenomenal - especially as it had to cross from the US of A into Canada! We received the complete order, via UPS, in two working days. We were surprised and very happy - considering the day and time ordered! The quality of the SilverBack vapor barrier is perfect. It was easy to cut and install and the 4 Waterproof Seam Tape is powerful - once down, it is not going to come off without a fight! I was able to do the complete job on my own, just working at it a few hours a day, finishing within six days. This has been one of the very best buying and building experiences. The (telephone) service was friendly, knowledgeable - and instant! I would recommend CrawlSpace Repair as being first-rate, both company and product. Thank you for being there! As an Architect practicing for over 30 years I took considerable time in researching and selecting this product for my personal house. A 1951 house with vented crawl space and no insulation.....the crawl space perimeter walls are now insulated, and the 12 Mil Silverback is in place and taped. I can already tell a difference....Now I am closing off the old exterior vents this weekend and have added HVAC duct air to temper the crawl space air. This product is very well constructed and is preforming. More later as the hot humid summer approaches...but I think this is going to be a good investment. The items in this order were superb and did just what was needed as did all of the CrawlSpace materials. The encapsulation went well because the materials are excellent and the advice/directions were on target and very helpful. Also, the success was due to the staff at CrawlSpace Repair, their excellent advice, and the printed directions. I am a very pleased customer with the materials and service. I have been very pleased at the quality of the 12 Mil SilverBackÃ¢â€žÂ¢ vapor barrier and with the Waterproof Seam Tape. The 13'4 width has worked very well for sizing sheets to lay down between the concrete pillars, and even the manufactured seam at half this width has been a convenient guide for cutting smaller sizes to go up the end walls or on the pillars. I've never undertaken such a big task in such a big, dark, damp space. But I found that proper lighting and steady work in one area at a time led to success that grew until the whole project was done. I ended up with a dry, clean, all-white encapsulation and look forward to using my crawl space for storage now that a dehumidifier has been hooked up. This vapor barrier is very tough. Even over an area where I had stone base the vapor barrier didn't fail. I've crawled over it now many times and only have seen some minor strain marks on the stone. This product is tough but easy to work with. Highly recommend it! The humidity in our house was hovering around 65 to 70% and now it's below 50%, without the use of a dehumidifier! It was not an easy task and it gave me the creeps seeing mice in there, but now that it's clean and done, I'm delighted! (And saved $3400...) Thank you so much for your support. Easy to use, lays down even when floor area is not flat, great product, highly recommended, Bad musty smell before we started, completely gone after two days, lowered radon level. Great material for your crawl space. Keep in mind that the thicker you go with the material the harder it will be to install around and in the corners. I went with the 12mil. Great product--prompt service and excellent price. Fixed odor and moisture issues. Fast delivery. Excellent Quality - Expect it will last a very long time. Highly recommend this product. This is the second time I've used your products. It went so well working on a friend's crawl space that when I had to do the smaller space under my house, I chose your products. I'm happy with the product and the results. Thanks for making a good product in the U.S. I'm very happy with the 12 Mil SilverBackÃ¢â€žÂ¢ and how the project turned out. I've had plumbers and electricians crawling across after it was done and it has held up very good. All the bad smell coming from below is gone. Thanks for the help! Your website is awesome and informative. Plus, when I called or emailed, you answered all of my questions. Customer service is so important and your products are great. Reviews from people are a great way to instill confidence in your products. I used the 20 Mil and 12 Mil SilverBackÃ¢â€žÂ¢ crawl space vapor barrier this weekend and the product is fantastic, easy to use, and arrived incredibly fast and undamaged. The Waterproof Seam Tape was also something I was glad I purchased. Thanks for making a great product! Excellent products. Everything purchased was just as described and worked perfectly. Thank you! The 12 mil SilverBack vapor barrier and the waterproof tape worked great. Both products were packaged well and delivered within three (3) days after I placed the order. The salesperson I spoke with was polite and well informed. I would highly recommend Crawl Space Repair to anyone looking to purchase vapor barrier products. Once I saw the DrySpace solution I knew others wouldn't compare in quality. I had no problems installing the vapor barrier and I couldn't be more pleased with the results. No more musty smell and a very clean, professional looking crawl space. I am confident it will increase the value of the house at resale time. I am very pleased with the Silver Back 12 mil and the foundation tape and seal tape worked very well. When I spend this kind of money it's nice to feel you got what you paid for.
. I was greatly impressed with the quality of the materials. The vapor barrier, both the 12 mil and 20 mil material, was extremely tough and have proven to be very effective in the short time it has been down. It almost would take a deliberate act to perforate the 20 vapor barrier which I used in the area that receives the most traffic. The 12 mil is a really great product. This was a great purchase. The vapor barrier is very well made and durable.i did the work myself, it only took one weekend. its worth the effort, spent much less then half of what the estimates i was getting. Would recommend this product. I was pleased to install the 12 mil at my customers request. It worked well. The customer is very pleased. I will continue to use this products on installs. 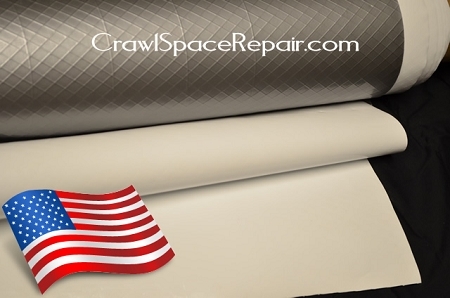 Foundation Seal Tape™ for Crawl Spaces- Made in the USA! Copyright Crawl Space Repair. All Rights Reserved.